Colorado Adventure Park is Grand County’s fastest, largest and safest locally owned Winter Park tubing hill. With your excitement in mind, we proudly offer a variety of activities to satisfy your quest for adventure. We offer Tubing, Double Tubing and Snow Scoots! Plus we make our own snow, so the fun is endless! Please make sure to stay connected with us online and on Facebook for updates! We are conveniently located just minutes from the Winter Park Ski Resort, and an easy 70 miles from Denver (Visit our hours and info link for more details). From young to young at heart we have something for you… see you soon!!!! Ready to have some fun? 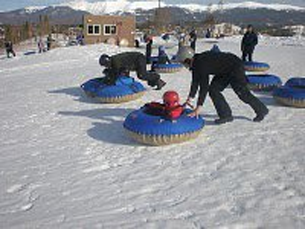 Check out all of the fun on the Activities page or just come on by our Winter Park tubing hill. We’re located in the Rocky Mountains just 70 miles from Denver, next to the Town of Fraser, Colorado and part of the new Grand Park community. For directions and a map, check out the Hours & Info page.